Please scroll down to find themes, resources and teachers’ comments linked to each book. English as a Second Language (ESL) teachers might be interested in my easy reader How to Make Money When You’re Twelve (published by Caramel Tree Press for students learning English in Korea). My Orca Currents novels Manga Touch and Siege may also appeal to older ESL students. Many of my novels have been enjoyed by adult students of English in Japan. There are so many kids like Emily Carr who have a spark somewhere inside them, but it doesn’t always show up in school. [Discovering Emily] inspired me to look for that spark in the kids I deal with every day. [The grade four students] all seem to be captivated with Emily, and have looked for websites about her early life and her later work. [The books have] been a stepping stone to looking at other Canadian artists and their work. . . .The set has filled my language arts needs extremely well as a read-aloud for the class and a point for discussion. Jacqueline Pearce’s books, particularly The Reunion and the Emily Carr stories, have been ideal for use with my adult students of English. The language, while simple enough for my students to grasp, is rich with descriptions of Vancouver Island’s history and environment, and the personalities of the characters are so real. My students laugh and nod as they get to know the characters, and they learn about the expressive qualities of the English language, something they could never find in most text books. – Background on the town of Paldi on Vancouver Island, where the story takes place. Canadian Encyclopedia article on Japanese internment in Canada during WW II. Canadian Broadcasting Corporation (CBC) article on Japanese internment. I started to read [The Reunion] one evening and couldn’t put it down until it was finished. Not only did I enjoy the story, but I was fascinated with the local history. [The] book has deepened my appreciation for my community. 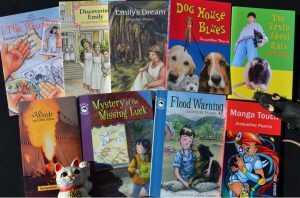 – Dog House Blues has also been published by Scholastic Canada (2008) as part of its Social Responsibility Book Club – Bully-Free Zone in the Moving Up with Literacy Place resource for grade 4-6 classrooms. The book is available as part of a classroom set with this resource package. More info here. The students are captivated with the characters, they empathize with the situations, and they make observations as we read. Dog House Blues would be an excellent addition to school, classroom and public libraries. This novel provides a realistic examination of the feelings and actions often shown by bullies and people they hurt. . . . this is a recommended read for any girl who is dealing with bullying. This is a story full of hope, friendship and humour, with believable characters both animal and human. [The stories] depict realistic responses to challenges, through the eyes and voices of teenagers. . . . Will encourage dialogue about important issues for young people. These short stories work well when you don’t have time to do a complete novel study. . . . a great way of generating class discussion around teen issues, as well as themes relevant to humane education and relationships between people and urban wildlife. “The Door” and “We’re In” are particularly powerful stories about people and animals. Teachers and students will find [these stories] useful for assignments requiring a short story that reflects the Canadian experience. – Click here for information about Orca’s resource guide for the Orca Currents Series. This is a great introduction to how Japan is experienced today. The characters have their strengths and weaknesses, which young readers can identify and grow with. – General background on the War of 1812 in the Canadian Encyclopedia, and War of 1812 re-enactment website (includes links to articles and documentary videos). Old Fort Erie info on Parks Canada website.